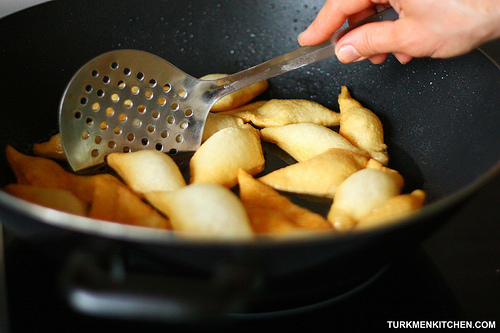 Pishme is a traditional Turkmen snack that is served with green tea during celebrations, especially weddings and baby showers. 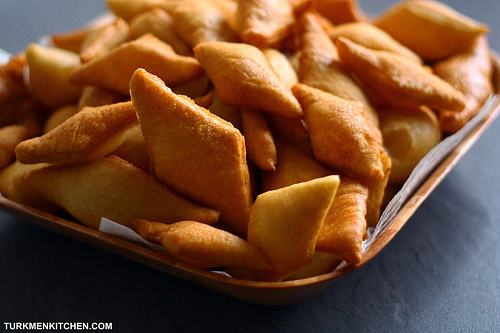 Although nowadays pishme is thought of as a sweet snack, it was originally prepared without sugar. I have added in sugar to my recipe but feel free to leave it out if you want a “truer” taste. And if you want a softer pishme, you can use milk instead of water. In a large bowl, mix the salt, sugar, yeast and water. Add the flour and work to a soft dough. Wrap the bowl in a thick kitchen towel until the dough is well risen, about 20 minutes. 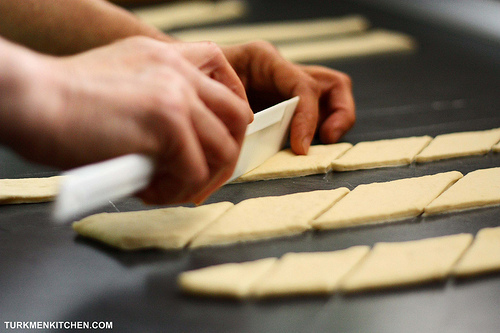 Divide the dough in half and roll each piece between your palms into a ball. Cover the dough balls with a kitchen towel and allow to rest for 5 minutes. 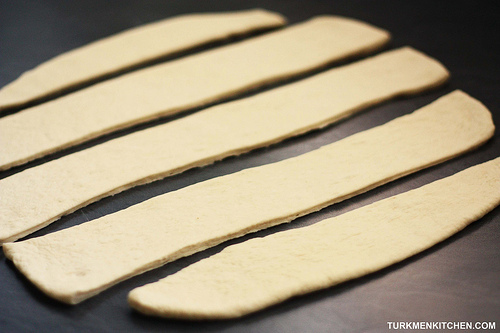 Roll out one ball of dough to 5 mm thickness. 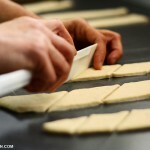 Cut the dough into long, 4-5 cm wide strips. Then cut the strips crosswise, making diamond shapes. Repeat with the remaining dough. 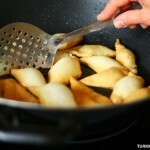 Pour oil into a frying pot until it is 4 cm deep, and place the pot over medium heat. When the oil is hot, drop in the pishme and stir continuously with a perforated spoon. Strain out the pishme when they are golden brown on both sides. Соседи всегда приносят по каким то причинам, я уже обьелся этих пышек. Kabir welayatlarda pişma geçigulak ya-da bogursak hem diyyarler. Gatlawuk, çapaty we çelpek hem toylarda hökman bolmaly lezzetlerimizden. Pişirilişi hem menzeş. Don’t you add sugar in your pişme? I believed pişme was a kind of sweets. I’m looking forward to your new recipe, by the way! If one wants to add sugar, how much is a good amount? I’ve never had or made these before. Sorry, didn’t see your comment earlier. Try 1-2 tablespoons.